Writing an overview of major historical movement is not easy to do well. The Reformation spanned several decades, several continents, and shook Europe to its core. It involved multiple key figures, both Catholic and Protestant, and altered not simply religious life, but Empire life forever. To write about this event in one single monograph, especially one that is only 191 pages, is to ensure that it will have weaknesses and oversights. Yet, Michael Reeves has done a masterful job in presenting an engaging overview that avoids historical reductionism. 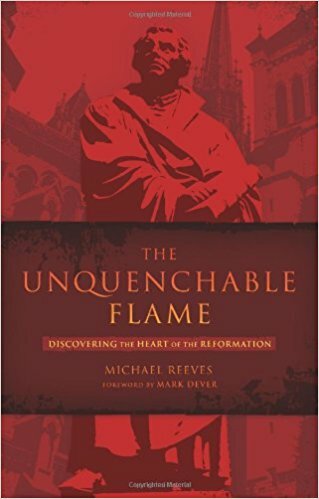 The Unquenchable Flame is the perfect introduction to the historical phenomenon that is the Reformation. In only seven chapters, Reeves walks readers through the major highs and lows of the Reformation. He sets the pre-Reformation context in chapter one, giving readers insights into the world prior to 1517. He touches on the nature of the Papacy and the doctrine of Purgatory. He also wrestles with the nature of religious devotion at that time. While many early Protestant scholars argued that Christians were fed up with the Catholic church on the eve of the Reformation, Reeves demonstrates his knowledge of the contemporary research which disputes this simplistic reading of the times. He gives us a more realistic, indeed complex, understanding of the pre-Reformation period. The following three chapters focus on the key leaders of the Magisterial reform: Luther, Zwingli, and Calvin. He gives some introduction to the so-called “Radical reformers” as well. In chapter five he turns attention to Reform in Britain, and in chapter 6 he looks specifically at the heirs of the Reformation – the Puritans. Chapter seven concludes with some thought-provoking challenges to the reader regarding the need to continually “reform” according to the Word of God. Reeves challenges the weakness in doctrine among the modern Evangelical church, our minimization of differences with Roman Catholics, and our need to always clarify and uphold the gospel. He leaves us with a reminder of the Reformation’s enduring value. Prior to the Reformation, he concludes, Christianity “had been buried under the centuries of human tradition.” And it is for that reason that the Reformation is still valid today (190). “The state of things today testifies,” he says, “as loud as ever, to the need for reformation.” The book’s historical survey, then, is a call to action not simply remembrance. Like many popular level treatments of the Reformation, this book follows a largely biographical focus. Yet, the nuances of the movement are not lost on Reeves. He notes the need to speak more broadly of reformations, for there were various kinds. He shows a great awareness of the debated issues, modern research, and clarifications on motivations behind historical events. He is keen to distinguish the various motivations at play in England, for example, with regard to Reform. While focuses with great intensity on Luther, Zwingli, and Calvin, Reeves does not ignore the more systemic issues related to reform’s progress. Reeves also writes with an attractive prose. He is not merely relating history, he is telling a story. In his foreword, Mark Dever compares this book to the famous Roland Bainton’s Here I Stand. Few books have the sort of well-deserved legacy that this work does on the subject of the Reformation. Bainton wrote a compelling narrative. Reeves has done a comparable job. His work is admittedly less detailed that Bainton’s, but it is as compelling. For those looking for a popular and accessible work, but one that does not simplify the history itself, this is the book. I highly recommend The Unquenchable Fire.